When only perfection will do, this breathtakingly elegant bouquet of magnificent pure white Avalanche roses is just right. Each immaculate bloom is beautifully contoured and pristine. We’ve simply added a few sparkling diamante pins to enhance the natural glamour to this stunning gift. This wonderfully feminine bouquet has a stylish, modern feel, showcasing a stunning selection of fresh flowers to brilliant effect. Lustrous lilac and cerise is complemented perfectly with light pink and vibrant green tones. It’s a colour palette that lifts the mood and looks just sensational. 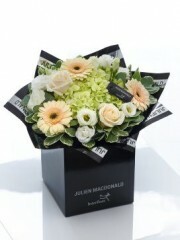 This resplendent hand-tied bouquet is a big impact gift that is sure to prompt a radiant smile of delight. We’ve selected these exquisite orchids with velvety green petals and hints of hot pink at the centre. Presented against a canopy of shimmering gold roses, the result is sensational. 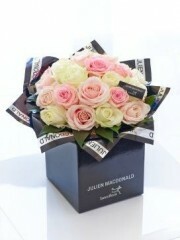 Wonderfully feminine with a dash of glamour, this designer floral gift is just perfect for a special occasion. These gorgeous gerbera and fresh germini in exquisite pink tones look simply sensational with richly coloured cerise roses. A sprinkling of glitter gives extra sparkle. This ultra-stylish design in vibrant lime and cerise is real showstopper. We’ve chosen distinctive mini orchids in an exotic shade of green and partnered them with classically beautiful roses and delicately textured tiny chrysanthemums. It’s an impressive gift that is rich in colour and detail. 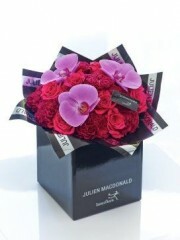 This design is an irresistibly chic combination of exquisite cool pink orchids and velvety roses. Look closer and see how each perfect orchid flower has a refined elegance that is truly exceptional. 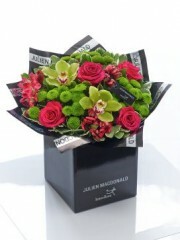 Set against canopy of ruby and cerise roses, this is an ultra-stylish gift for someone very special. From warm peach to creamy white to the palest green, here the balance of fresh flowers in pastel tones works beautifully. Ideal for any occasion – or even ‘just because’ – this floral gift will brighten her room beautifully and is sure to prompt a radiant smile. Captivating, romantic, irresistible – this gorgeous bouquet shows how breathtakingly beautiful fresh flowers can reflect an individual or a mood just perfectly. This bouquet is a harmonious selection of premium quality roses in soft pinks and pristine white – expertly hand-tied for optimum impact. 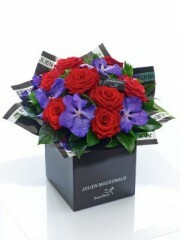 Two of the most enchanting flower varieties feature in this sumptuous bouquet. A striking partnership of the finest quality exotic purple orchids, partnered with magnificent velvety roses in classic red – this is a magical gift that is both naturally stylish and wonderfully luxurious. The hydrangea is back in vogue – and when you see this picture-perfect canopy of petals in pastel pink, it’s easy to see why. 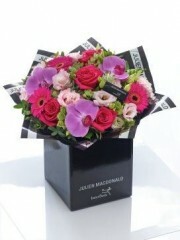 Here we’ve chosen the finest quality blooms and presented them in sumptuous designer packaging. 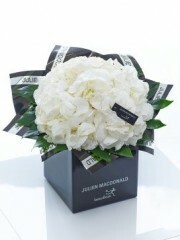 It’s a chic and understated gift that just exudes natural beauty. This sensational sculpted design brings together the finest quality flowers and cutting edge floral design to create an astonishing statement piece. Striking and contemporary, with a tall slender shape and a sense of grace and grandeur, this is an outstanding gift that will transform their home. 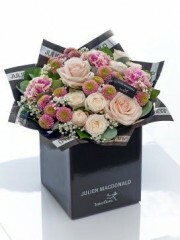 This hand-tied bouquet in glorious warm pink and peach tones has a timeless quality that is particularly captivating. Inspired by the enduring appeal of these classic flower varieties, we’ve selected the finest quality fresh blooms to create this very feminine, vintage style gift. 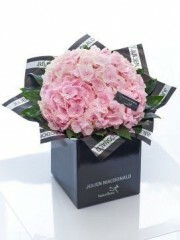 Bursting with exuberance and vitality, these exquisite hydrangea make a wonderful gift. The abundance of delicate white petals ensures there is plenty to admire. 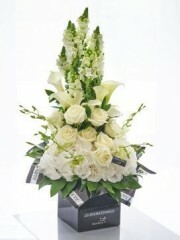 By opting for pristine white with a little foliage, the natural splendour of these flowers really stands out. 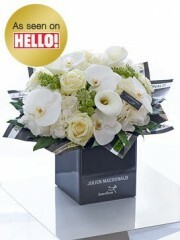 This heavenly bouquet is a pristine presentation of elegant simplicity. 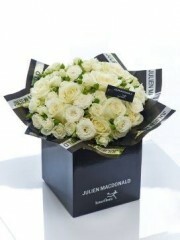 The very finest quality fresh flowers in cream, white and ivory are expertly hand-tied to stunning effect. Sleek calla lilies and orchids contrast with intricate rose and hydrangea petals, resulting in an elegant, indulgent, and infinitely beautiful gift.